The Price is Right Spin and Win Fruity Slots represents something of a fusion between traditional Vegas "Red 7" style slots and British slots which offer a nudge feature. The game is easy to play and offers some nice payouts. The symbols on The Prices is Right Spin and Win Fruity Slots are, appropriately enough, fruit. There are wild symbols on this game. The graphics are very easy to read and bold colors and crisp lines are the norm. This game can payout to 100,000 coins on the maximum bet, a handy sum for anyone! There is no autoplay feature on The Price is Right Spin and Win Fruity Slots but there are some time-savers built into the interface. Players may increase their bet by one credit by pressing the "Bet One" button before any spin. Players may also simply enter the maximum bet for any spin by pressing that button. Cashing out is a one button affair, as well. 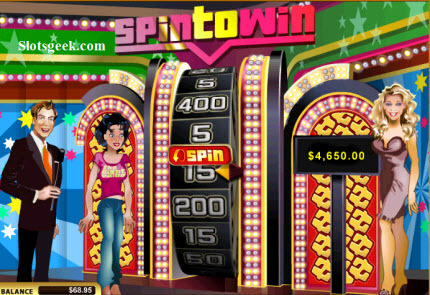 The paylines on The Price is Right Spin and Win Fruity Slots could not be easier. There is one line, in the middle of the three reels that comprise the game's interface. If a player lands any two symbols on a payline, they may spin only the third reel for another shot at making a row. The highest payout on The Price is Right Spin and Win Fruity Slots is 100,000 coins for getting three-of-a-kind of the wild symbols. The wild symbol has the name "Wild" written directly across the graphic. Standard payouts are for three-of-a-kind matches. Three red seven symbols nets 350 coins, 3 silver seven symbols awards 250 coins and 3 blue seven symbols awards the player 175 coins. Other winning symbols include the traditional bar symbols and the various fruit symbols found on the reels. The payout table is accessed from the game's menu. The bonus features on The Price is Right Spin and Win Fruity Slots is unique. There is a series of bars under the reels that build up as the player wins more spins. 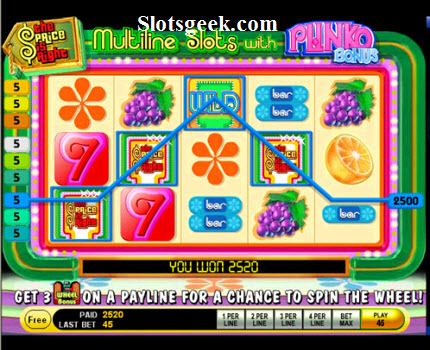 When they are filled up completely, the player may roll the dice at the bottom of the screen to advance through the various trails at the side of the bars. Advancing through these trails opens up bonus features on the game. The player is allowed to collect nudges, cash or spins as they advance down the trail. If they opt for spins, they enter into a bonus game where every spin is a winner. If a player gets 3 of a kind on any spin, they have the chance to play the hi-lo wheel which increases their winnings. The Price is Right Spin and Win Fruity Slots is a great game for those who prefer more traditional, single-line interfaces with straightforward payouts. The addition of features like nudges and the free spin bonuses make it different enough from the norm to keep in interesting to everyone, very experienced players or newcomers to slots.